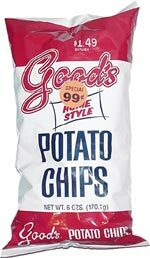 Taste test: Like several Pennsylvania-based chip companies, Good's chips are made with lard, and it gives them a much different texture and taste than your typical vegetable oil-based chips. Some people really go for this taste, but most of our tasters found them to taste greasy and not be all that appetizing. It's not an awful taste, but we tended to eat one chip and not go back for a second, which is much different from how we typically eat chips. The grease, however, is just in the taste, as they don't leave any residue on your fingers. There's no need for a napkin with these chips. Also, they seem to be fairly low in salt. Smell test: A bit different from most potato chips. Kind of potatoey, but also kind of oily. This snack was discovered by Eric Ricker. Review published .